It was high time someone did it... a kids Ramones parody band. Lots of artists have dabbled in the garage/punk/pop style, but the Boogers do nothing but rock Ramones-style. A sonic pop onslaught, & brief, catchy kid tunes that truly rock. 1) How did the Boogers form? The formation of the Boogers was the result of two things. The first was mucus, which our bodies make to prevent our nasal passages from drying out and to humidify the air which we inhale. The second component was dust, lint, and other contaminants which are removed from the air we breathe by contact with the sticky mucus. As the water in the mucus evaporated it left behind the contaminants and thickened mucus which is commonly called the Boogers. The idea actually hit me almost 10 years ago when I was in a “serious” punk rock band. We were at my guitar player’s house and put on one of our CDs for his young daughter (who had only been exposed to Barney and Veggie-tales at the time). She immediately responded to the fast beat by jumping around like crazy. Subsequent exposures to other young ones confirmed that kids cannot resist this kind of music. I came up with and promptly forgot the idea for a punk rock band for kids because it wasn’t relevant to me at the time. For ‘Road to Rock’ I did all the parts myself. Since then, as the demand for (and size of) our live shows grew, I recruited Greenie Booger for bass and Sticky Booger on drums. Sticky was tricky…it took a while to extract him. Greenie is a father of twin boys and lives right down the street from me. Sticky (who has three of his own) and I have known each other since high school and we’ve spent a lot of nights on the road and the stage together. We are a very tight group…Boogers stick together. 2) How do kids respond to Boogers …err, your punk sound? Kids love to pick the Boogers because they make them dance, bounce around, and sing. Kids find Boogers irresistible. There’s something about a four-on-the-floor beat at 160-180 bpm that just resonates with kids. We have yet to play for a kid who hasn’t become a fan. Interestingly, a lot of the fan mail we’ve received from our website (meet-the-boogers.com) has the parent first telling us how much they like it personally…and then telling us that their kids loved it too. 3) Ramones influences are everywhere, jacket, music, emblem…was there any issues of getting permission or paying royalties? For us, the Ramones epitomize the spirit of rock and roll…short, simple songs with catchy melodies that make you want to jump around. As you might guess, we think the Ramones are among the greatest rock bands ever…at a time when the airwaves were dominated by Adult Contemporary (James Taylor), Disco, and huge arena acts, they came along and saved the essence of rock and roll…and we want to do the same thing for kids’ music. Don’t get me wrong, we love and appreciate all kinds of children’s music and musicians – it’s just that every time we listened to a kid’s band that claimed to really “rock” they always fell short in our opinion. To answer your question after that digression, there were no real issues. The jacket is essentially a parody of the Ramones’ Road to Ruin album and the emblem is a parody of their emblem (which itself is a parody of the presidential seal) and parodies don’t need permission. Jay Lynch did the cover art – He is super interesting guy…he was one of the founders of the underground comics movement from the 60’s, he worked for Mad magazine, designed almost all of the Wacky Packages, and recently released an awesome children’s book (Otto’s Orange Day). Anyway, Jay knows John Holmstrom who worked on the original Road to Ruin cover (as well as the back cover illustration for Rocket to Russia). He showed the stuff to John, and John was totally into it. It didn’t hurt that Jay is one of John’s heroes. So in terms of visually presenting the band, we wanted to make sure that proper homage was given and to clearly indicate what the band is going to sound like once you open that CD. In terms of the music, we covered two Ramones songs on this album (but completely rewrote the lyrics). Of course for these we had to pay to acquire the proper licenses. 4) I’m hearing a bit of DK’s & other punk influences. Am I off? There’s certainly a bit of that in there, but it’s fairly minimal. As you get outside the Ramones style of punk, you tend to get more dissonance and stuff in minor keys (which kids don’t like so much). Like the Ramones, major key bubble gum pop with a buzz saw guitar is our bread and butter. On the album, I think the biggest departures from that style are the songs “Peanut Butter and Jelly” and “Mary” which are much more of a thrash style. There’s a fun video of PB&J starring two of my sons on YouTube. Besides the Ramones, we’re influenced by a range of stuff. As a kid, I grew up listening to my Mom’s old 45’s – early Beatles, Chuck Berry, Monkees, Beach Boys, Tommy Jones. My Dad was a country fan and really turned me onto Hank Williams, Sr.. All of these artists had a beautiful simplicity to their songs, so it doesn’t surprise me that I gravitated to the Ramones as a teenager. I’m also very into reggae and Frank Zappa. On our version of Wheels on the Bus, there’s Zappa reference from Joe’s Garage. 5) What do the Boogers do when not rockin’ kids? We hang out with our families and do normal Dad stuff. Go to the park. Play games. Read books. Listen to music. Talk. Play superheroes. Coach tee-ball. My boys and I play a lot of music together. Josh seems like a natural for the lead singer spot – like most five-year-olds, he already has the requisite ego. He likes making up the set lists. My second son, Matt, is a stone-cold natural on the drums. He’s four years-old and can already play a floor-tom ride like nobody’s business. My third son is a year old and is still discovering what role he might like to play. 6) Does your Psychology background influence your music? How? While I have to say that having kids is a bigger influence on my music than my background in developmental psychology, it definitely has had an influence. While working on my Ph.D., I worked at the university’s day care center for children with developmental disabilities and would play guitar for them. It was really my first experience playing music for kids. I also learned a lot about and did a lot of research on language acquisition, cognitive development, and social development. I find it incredibly interesting that music (pitch, tempo, rhythm) is the basis/building block for almost all spoken language across almost every culture – we communicate with music before we can even speak. And music can help facilitate language and social development. For example, “call and response” songs help teach kids how conversations work and rhyming teaches kids about how words are constructed. Understanding attention spans at different developmental levels is pretty important too. You shouldn’t write a 5-minute song for a 5-year-old. So things like this influence my songwriting. In my opinion, the ability to creatively adapt has always been one of humankind’s greatest abilities and that ability will only become more important for future generations. By adding new sections to classic kids’ songs and creating mash-ups like ABC/Twinkle/Black Sheep (which I believe you have also done, Yosi), adaptation is one of the hidden themes in Road to Rock. And it’s amazing how kids can learn to creatively adapting and co-opt. My boys are already doing this. Unfortunately, most of the lyrics they come up with right now have to do with pooh. But enough of this pretentiousness. Unlike the makers of Baby Einstein, we don’t claim that our music is any better than any other for turning your kid into some kind of Einstein. There is, however, ample research which demonstrates that listening and enjoying music with your kids will increase their love of music. And a love of music will last a lifetime. At the end of the day, the Boogers just want kids to have fun and rock out. 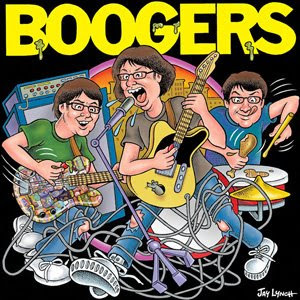 7) Where can punky families pick the Boogers CD & see them live? Our debut CD ‘Road to Rock’ is available on Amazon and CDBaby. CDBaby has snippets of the songs and our website has a number of free songs to download. Our next show is January 25th at the Wonder Works Children Museum in Oak Park, IL. We plan on playing a lot of shows during the festival season, so be sure to check back! Thanks Yosi! !